Elizabeth City, NC – Perhaps the best kept boat station secret in the Mid-Atlantic region lies nestled within the largest Coast Guard facility in the country, at Coast Guard Base Elizabeth City in Eastern North Carolina. Coast Guard Station Elizabeth City is easy to pass without realizing it’s there, located in an unassuming off-white building that looks like part of the neighboring air station complex. The boathouse on the nearby Pasquotank River is almost a hundred yards away. 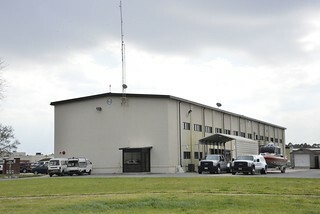 The crew at the boat station is accustomed to the surrounding flurry of aviation activity — the base is also home to Coast Guard Air Station Elizabeth City and the Coast Guard Aviation Technical Training Center (ATTC), where all enlisted Coast Guard aviation personnel are trained in their chosen professions. 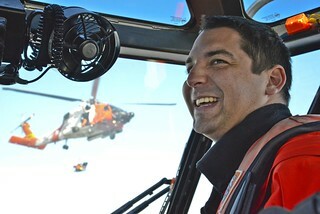 Consequently, the vast majority of people coming and going from the base each day are connected to Coast Guard aviation in some way. Hernandez acknowledged there’s an age-old rivalry between air and boat crews, but explained how he thinks it makes the service stronger. Hernandez admitted there are times when it’s frustrating to respond on the water. 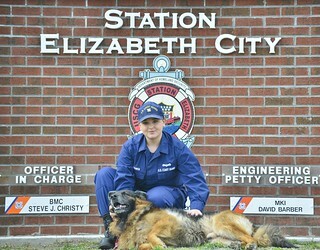 The crew adopted Bert, a German Shepherd and former explosive detection dog who worked for six years with the Coast Guard Maritime Safety and Security Team in Galveston, Texas. He’s arguably the most popular guy on base. 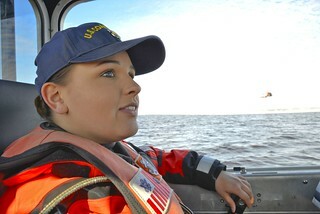 Bowen said that after Bert, what she likes most about Station Elizabeth City is the opportunity to see all the Coast Guard jobs conducted around her. Even while they assist with helicopter training missions, Station Elizabeth City crews are responsible for responding to emergencies in an area of responsibility that spans 1,700 square miles, includes 10 rivers and three sounds as well as the Intracoastal Waterway and Dismal Swamp Canal. When they aren’t actively working, Coast Guardsmen on the base engage in sports, often competing with teams from different units. The station crew says they enjoy heated ultimate frisbee showdowns with the rescue swimmer shop, and basketball games against the MH-60 Jayhawk team from the air station. That recreational competition keeps the healthy rivalry alive and thriving in a service of the same status.